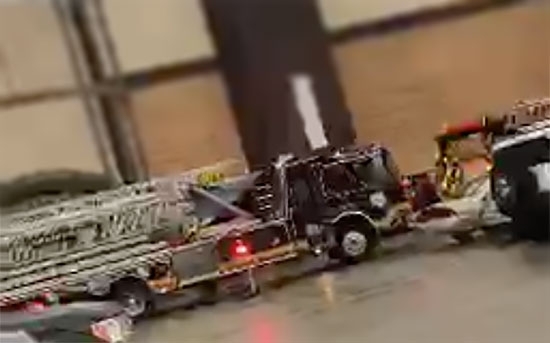 Thousands of shoppers were evacuated from the Springfield Mall in Delaware County on 'Super Saturday' due to a grease fire at a pizza restaurant inside the mall. It happened after 3 p.m. at the large shopping mall on Baltimore Pike in Springfield in the kitchen of Sbarro's in the food court. Alarms sounded and everyone was forced to the leave the enclosed shopping mall due to smoke. The fire was brought under control by 3:30 p.m., but the building was still evacuated for about an hour. This is traditionally the second largest retail shopping day of the year for both last minute shoppers and retailers. Philadelphia Police are looking for a suspect wanted for shooting and injuring a young girl while she was being held by her father last night in Southwest Philadelphia. It happened after 11 p.m. on the 5900 block of Springfield Avenue. They had just parked their car and the father was carrying his 4-year-old daughter in his arms to their home when a red sedan with four men drove by. The car made a u-turn and came back down the street. Someone inside opened fire on the pair. The girl was hit once in the leg. She was taken to St. Christopher's Hospital and is in stable condition. Police believe they were targeted, but are trying to determine a motive. Law enforcement officers in Harrisburg shot and killed a suspect Friday night after he had targeted and shot at police officers in several locations in the state capitol yesterday. Dauphin County District Attorney Ed Marsico identified the suspect as 51-year-old Ahmed Aminamin El-Mofty. It started around 4 p.m. when he opened fire on a Capitol police officer hitting his car. He just missed the officer. El-Mofty then shot a Pennsylvania state trooper a short time later and a few blocks away. He slightly injured the trooper. El-Mofty was killed in a shootout with police. Marsico says the suspect was directly targeting police officers. El-Mofty does have ties in the Middle East and has recently travelled there. They do not know the motive. No one on the Phillies will wear #34 next season in honor of Roy Halladay. In 2017, catcher Andrew Knapp was assigned #34 after making the big league club. He will switch to #15, his college number. The Phillies have not announced any plans for a possible tribute patch for next year. Veteran defenseman and 2-time Pro Bowler Trent Cole has announced that he will retire as a Philadelphia Eagle this Christmas. Cole played 10 seasons in South Philly as a defensive end and linebacker and the last 2 seasons in Indianapolis. He is second all time in the franchise with 85.5 sacks. Cole will be an honorary captain for Monday Night's home game vs Oakland.